A new study conducted by Norwegian researchers has revealed the health benefits of regular high-intensity exercise. For the CONSORT trial, men aged 35 to 45 were recruited between January and April 2009. All of the men were healthy but inactive, with a body mass index of 25 to 30 kg/ m2. The participants had not exercised regularly for at least two years prior to the trial. They were divided into two groups with different exercise training protocols performed three times per week for ten weeks. The first group’s sessions included four minutes of intense exercise at 90% maximal heart rate four times, interspersed with three minutes of active recovery at 70% heart rate in between the four-minute bursts. For the second group’s sessions, participants only performed one four-minute intense session at 90% maximal heart rate. Although it is recommended that people exercise for 30 minutes a day at least five days a week, studies show that only 15% to 30% of people actually do this. This new research demonstrated that around 15 minutes of exercise three times a week may also have significant health benefits, as long as just a few minutes of the total time is spent doing intensive endurance training. Both groups increased their maximal oxygen intake; the first group by 13% and the second group by 10%. Maximal oxygen intake is a strong predictor of physical fitness and mortality. Both groups of participants also saw changes in oxygen cost during running and a significant reduction in submaximal workload. All participants also experienced lower blood pressure and a decrease in fasting glucose. The group that did four intense bursts for each session, rather than just one, had additional benefits. The trial showed that this group experienced reduction in body fat and lower cholesterol as a result of their ten weeks of exercise. Both groups did ten minutes of warm-up and a five minutes of cool down for each exercise session. Total exercise time was about 19 minutes for the first group and 40 minutes for the second group. 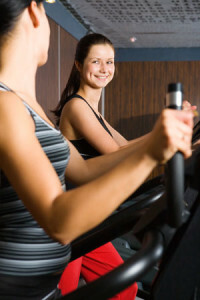 Exercises consisted of walking, jogging, or running on an inclined treadmill. Speeding up helped increase heart rate; slowing down decreased it. Participants wore heart monitors while exercising. At the 90% maximal heart rate, people should be breathing heavily and should not be able to talk in complete sentences, according to researcher Arnt Erik Tjonna. Other research has analyzed the benefits of exercise therapy, including treating back pain, healing knee pain, and relieving migraine. Tjonna AE, et al. Low-and high-volume of intensive endurance training significantly improves maximal oxygen uptake after 10-weeks of training in healthy men. PLoS One 2013; 8(5): e65382. doi:10.1371/journal.pone.0065382. Boyles S. Short, intense workout goes a long way. MedPage Today June 2, 2013. Written by: Kelly Johnson on June 6, 2013.Modified on June 5, 2013.